1. Heat 2 tablespoons oil in a pan, add 1 teaspoon cumin, 1 teaspoon mustard seeds and stir well. 2. Add 1 teaspoon black pepper, 1 teaspoon salt and stir again. 3. Then, add 200 grams onions and fry till translucent. 4. Now, add 150 grams spinach and mix it well. 5. Cook for 5 - 7 minutes on medium heat. 6. Add 1 1/2 teaspoons butter and mix it well. 7. Cook for another 3 - 5 minutes. 9. Heat 1 tablespoon butter in a another pan, add 1 teaspoon turmeric and stir well. 10. Add 1 teaspoon garam masala and stir again. 11. Now, add 5 beaten eggs and stir continuously to make bhurji. 12. Cook or 3 - 5 minutes on medium heat. 13. Then, add the cooked spinach in it and mix it well. 14. Cook for another 3 - 5 minutes. 15. Remove it from heat and keep aside. 16. In a mixing bowl, add 230 grams curd and whisk it well. 17. Add 1/2 teaspoon salt, 1/2 teaspoon turmeric, 2 tablespoons mint and mix it well. 18. Take a tortilla and place it on a hot tawa. 19. Cook on moderate heat for 2 - 3 minutes from both sides. 20. Remove it from heat and place it on a board. 21. 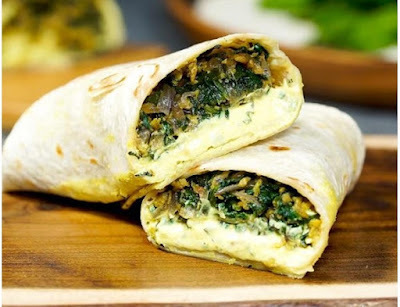 Add the prepared egg and spinach on it. 22. Top with prepared curd mixture. 23. Roll the wrap properly and cut it into half.